Kick off your visit on the 8th (Tue): pause for some serene contemplation at Christ Church Cathedral Darwin, then take in the architecture and atmosphere at St Mary Star of the Sea Catholic Cathedral, and then see exotic creatures in open habitats at a safari tour. On the next day, browse the exhibits of Mbantua Fine Art Gallery, browse the different shops at The Book Shop Darwin, then learn about all things military at East Point Military Museum, then examine the collection at 1934 Qantas Hangar, and finally witness a stunning natural landmark at Tjuwaliyn (Douglas) Hot Springs Park. To see maps, photos, more things to do, and tourist information, read Darwin attractions planner . Amsterdam, The Netherlands to Darwin is an approximately 26-hour flight. You can also do a combination of train and flight. The time zone difference when traveling from Amsterdam to Darwin is 8 hours. In October, Darwin is warmer than Amsterdam - with highs of 39°C and lows of 28°C. Wrap up your sightseeing on the 9th (Wed) to allow time to drive to Jabiru (Kakadu National Park). Jabiru is a town in the Northern Territory of Australia. Get outdoors at Maguk Gorge and Anbangbang Billabong. Nourlangie Rock and Injalak Arts are good opportunities to explore the local culture. The adventure continues: look for all kinds of wild species at Cahills Crossing, explore the striking landscape at Nanguluwur Art Site, and don't miss a visit to Bardedjilidji Walk. For ratings, more things to do, other places to visit, and more tourist information, you can read our Jabiru (Kakadu National Park) trip itinerary maker tool . Traveling by car from Darwin to Jabiru (Kakadu National Park) takes 2.5 hours. Alternatively, you can take a bus. Finish your sightseeing early on the 13th (Sun) so you can drive to Katherine. Katherine is a town in Northern Territory, Australia. On the 14th (Mon), explore the striking landscape at Katherine Gorge, then take in the exciting artwork at Top Didj Cultural Experience & Art Gallery, and then identify plant and animal life at Low Level Nature Reserve. For reviews, ratings, photos, and tourist information, read Katherine trip planning app . Getting from Jabiru (Kakadu National Park) to Katherine by car takes about 4.5 hours. Other options: take a bus; or do a combination of bus and train. October in Katherine sees daily highs of 44°C and lows of 26°C at night. Finish your sightseeing early on the 14th (Mon) so you can travel to Litchfield National Park. 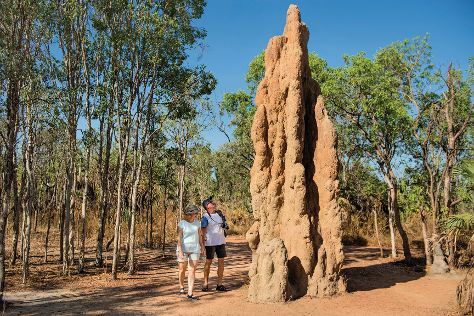 Visiting Magnetic Termite Mounds and Florence Falls will get you outdoors. Eschew the tourist crowds and head to Adelaide River War Cemetery and Robin Falls. Change things up with these side-trips from Litchfield National Park: Adelaide River (Adelaide River Railway Museum & Adelaide River Railway Bridg). To find traveler tips, other places to visit, maps, and more tourist information, use the Litchfield National Park route planner. The Route module can help you plan travel from Katherine to Litchfield National Park. Traveling from Katherine in October, expect nights in Litchfield National Park to be about the same, around 28°C, while days are little chillier, around 39°C. Wrap up your sightseeing on the 18th (Fri) early enough to travel to Kununurra. Start off your visit on the 18th (Fri): take in the exciting artwork at Birdland Functional Art, then take in the exciting artwork at Artlandish Aboriginal Art Gallery, then take an in-depth tour of Kununurra Museum, and finally contemplate the waterfront views at Molly Springs. Get ready for a full day of sightseeing on the next day: explore the wealth of natural beauty at Mitchell River National Park. To find photos, more things to do, traveler tips, and tourist information, use the Kununurra online tour planner . The Route module can help you plan travel from Litchfield National Park to Kununurra. Due to the time zone difference, you'll gain 1 hour traveling from Litchfield National Park to Kununurra. Traveling from Litchfield National Park in October, you will find days in Kununurra are a bit warmer (45°C), and nights are about the same (25°C). Finish your sightseeing early on the 19th (Sat) so you can travel to Windjana Gorge National Park. King Leopold Ranges Conservation Park has been added to your itinerary. Here are some ideas for day two: take in the dramatic natural features at Windjana Gorge and then identify plant and animal life at King Leopold Ranges Conservation Park. For maps, ratings, and more tourist information, read Windjana Gorge National Park tour planning website . Traveling by car from Kununurra to Windjana Gorge National Park takes 12 hours. Alternatively, you can fly. On the 22nd (Tue), you'll travel to Broome. Kick off your visit on the 23rd (Wed): see the interesting displays at SSJG Heritage Centre, enjoy the sand and surf at Roebuck Bay, and then kick back and relax at Reddell Beach. To find photos, ratings, other places to visit, and tourist information, read Broome day trip planning site . Traveling by car from Windjana Gorge National Park to Broome takes 8 hours. 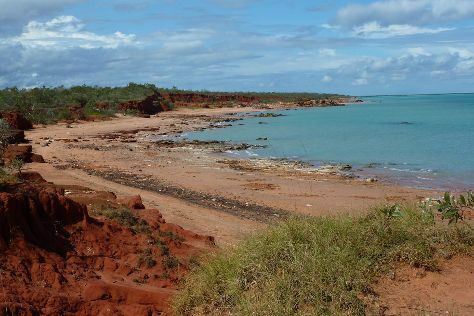 In October in Broome, expect temperatures between 39°C during the day and 28°C at night. Cap off your sightseeing on the 24th (Thu) early enough to travel to Karratha. Karratha is a city in the Pilbara region of Western Australia, adjoining the port of Dampier. For photos, more things to do, traveler tips, and other tourist information, read our Karratha attractions website . The Route module can help you plan travel from Broome to Karratha. You will have some time to spend on the 26th (Sat) before leaving for Coral Bay. Coral Bay is a small town on the coast of Western Australia, north of Perth. Get ready for a full day of sightseeing on the 27th (Sun): enjoy the sand and surf at Coral Bay Beach and then look for all kinds of wild species at Ningaloo Marine Park. To see ratings, traveler tips, maps, and tourist information, use the Coral Bay trip maker app . You can drive from Karratha to Coral Bay in 5.5 hours. Alternatively, you can fly. Finish up your sightseeing early on the 29th (Tue) so you can travel to Carnarvon. Carnarvon is a coastal town situated approximately 900km north of Perth, Western Australia. Start off your visit on the 29th (Tue): admire all the interesting features of The Fascine, then take an in-depth tour of Carnarvon Space and Technology Museum, and then take your sightseeing to a higher altitude at Mount Augustus. To see where to stay, reviews, traveler tips, and tourist information, read our Carnarvon online travel route builder . Getting from Coral Bay to Carnarvon by car takes about 2.5 hours. October in Carnarvon sees daily highs of 32°C and lows of 20°C at night. Wrap up your sightseeing on the 30th (Wed) to allow time to travel to Kalbarri. Start off your visit on the 30th (Wed): explore the gorgeous colors at Blue Holes, explore the striking landscape at Eagle Gorge, then explore the striking landscape of Ross Graham Lookout, then identify plant and animal life at Kalbarri Pelican Feeding, and finally explore the striking landscape at Island Rock & Natural Bridge. Take the guesswork out of planning a Kalbarri vacation by using our trip itinerary maker. You can drive from Carnarvon to Kalbarri in 5 hours. Another option is to fly. Wrap up your sightseeing on the 31st (Thu) to allow time to drive to Geraldton. Geraldton is a coastal city in the Mid West region of Western Australia, located 424km north of Perth.At June 2015 Geraldton had an estimated urban population of 39,825. Your cultural itinerary includes sights like Museum of Geraldton and Oakabella Homestead, Tea Rooms and Campground. You'll explore the less-touristy side of things at The Tin Heads and Coalseam Conservation Park. You'll find plenty of places to visit near Geraldton: Port Denison (Granny's Beach & South Beach), Irwin Heritage River Trail (in Dongara) and Our Lady of Mt Carmel Church (in Mullewa). And it doesn't end there: learn about all things military at HMAS Sydney II Memorial, view the masterpieces at Latitude Gallery Jewellers, enjoy the sand and surf at Back Beach, and identify plant and animal life at Greenough Wildlife Park. To see photos, traveler tips, reviews, and more tourist information, go to the Geraldton trip itinerary planning site . Drive from Kalbarri to Geraldton in 2 hours. Alternatively, you can do a combination of taxi and bus. October in Geraldton sees daily highs of 30°C and lows of 13°C at night. Wrap up your sightseeing on the 10th (Sun) to allow time to travel to Perth. On the 10th (Sun), contemplate in the serene atmosphere at St. Mary's Cathedral, examine the collection at Aviation Heritage Museum, and then look for all kinds of wild species at Matilda Bay Reserve. 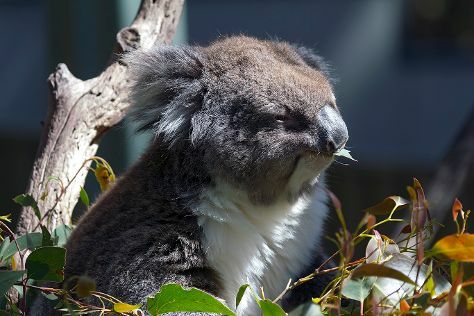 On the 11th (Mon), you'll have a packed day of sightseeing: steep yourself in history at The Perth Mint, see the interesting displays at Revolutions Transport Museum, and then look for all kinds of wild species at Caversham Wildlife Park. For maps, photos, more things to do, and more tourist information, you can read our Perth trip itinerary planner . Traveling by flight from Geraldton to Perth takes 3 hours. Alternatively, you can drive; or take a bus. In November, plan for daily highs up to 33°C, and evening lows to 15°C. Wrap up your sightseeing on the 12th (Tue) early enough to drive to Fremantle. 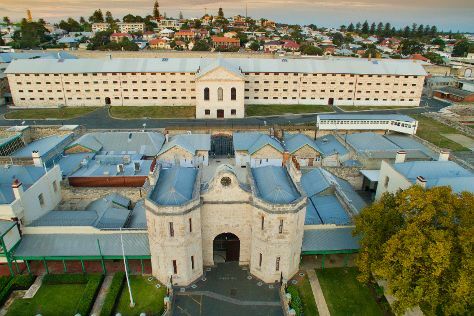 On the 12th (Tue), admire the masterpieces at Fremantle Arts Centre, get engrossed in the history at Fremantle Prison, and then see the interesting displays at The Shipwreck Galleries. To find where to stay, other places to visit, traveler tips, and more tourist information, read Fremantle trip planning website . Fremantle is very close to Perth. In November, plan for daily highs up to 32°C, and evening lows to 15°C. Cap off your sightseeing on the 12th (Tue) early enough to go by car to Margaret River. Kick off your visit on the 13th (Wed): contemplate the waterfront views at Bunker Bay, then explore the striking landscape at Sugarloaf Rock, and then relax in the rural setting at Wonky Windmill Farm & Eco Park. Here are some ideas for day two: kick back and relax at Surfers Point and then identify plant and animal life at Eagles Heritage Wildlife Centre. For where to stay, maps, more things to do, and other tourist information, use the Margaret River trip planner . Traveling by car from Fremantle to Margaret River takes 3 hours. Alternatively, you can take a bus; or do a combination of train and bus. Finish up your sightseeing early on the 14th (Thu) so you can go by car to Pemberton. Step off the beaten path and head to Walpole-Nornalup Inlet and Warren National Park. Take a break from the city and head to Gloucester National Park and Pemberton Mountain Bike Park. Go for a jaunt from Pemberton to Walpole to see Circular Pool about 1h 25 min away. It doesn't end there: explore the galleries of Peter Kovacsy Studio - Wood & Glass Sculpture Gallery. To see photos, ratings, maps, and other tourist information, you can read our Pemberton trip app . Traveling by car from Margaret River to Pemberton takes 2 hours. Alternatively, you can take a bus. Finish up your sightseeing early on the 17th (Sun) so you can go by car to Esperance. Esperance is a town in the Goldfields-Esperance region of Western Australia, on the Southern Ocean coastline approximately 720km east-southeast of the state capital, Perth. To see where to stay, photos, more things to do, and other tourist information, you can read our Esperance trip itinerary maker . Getting from Pemberton to Esperance by car takes about 8 hours. Other options: do a combination of bus and flight; or do a combination of bus and train. 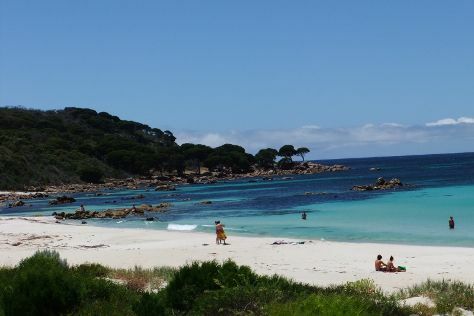 In November in Esperance, expect temperatures between 28°C during the day and 13°C at night. You'll set off for Nullarbor on the 18th (Mon). Step off the beaten path and head to Nullarbor National Park and Great Australian Bight. To see maps, more things to do, reviews, and more tourist information, you can read our Nullarbor trip itinerary builder . You can drive from Esperance to Nullarbor in 14 hours. Alternatively, you can fly. The time zone changes from Australian Western Standard Time to Australian Central Standard Time (South Australia), which is usually a 1 hour difference. 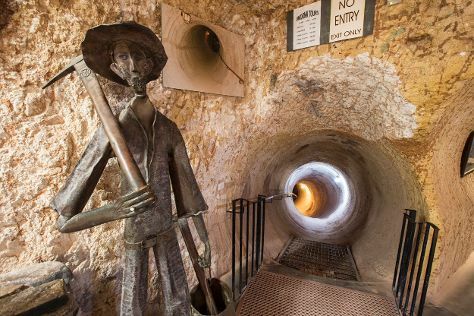 You'll set off for Coober Pedy on the 21st (Thu). On the 22nd (Fri), take an in-depth tour of Umoona Opal Mine & Museum, take in the architecture and atmosphere at St Peter & Pauls underground Catholic Church, then examine the collection at Old Timers Mine, and finally take in the architecture and atmosphere at Serbian Orthodox Church. On the next day, admire the striking features of Faye's Underground Home and then look for all kinds of wild species at Breakaways Conservation Park. For more things to do, traveler tips, photos, and other tourist information, go to the Coober Pedy day trip website . Traveling by car from Nullarbor to Coober Pedy takes 16.5 hours. Alternatively, you can fly. In November, plan for daily highs up to 38°C, and evening lows to 20°C. On the 23rd (Sat), wrap the sightseeing up by early afternoon so you can travel to Adelaide. Step off the beaten path and head to Gorge Wildlife Park and National Railway Museum Port Adelaide. National Motor Museum and Art Gallery of South Australia will appeal to museum buffs. There's lots more to do: enjoy the sand and surf at Glenelg Beach, stroll through Henley Beach, and contemplate the long history of Adelaide Oval. To see ratings, maps, traveler tips, and more tourist information, go to the Adelaide road trip planning tool . Getting from Coober Pedy to Adelaide by flight takes about 4 hours. Other options: drive; or take a bus. Traveling from Coober Pedy in November, expect Adelaide to be slightly colder, temps between 28°C and 15°C. Finish up your sightseeing early on the 26th (Tue) so you can travel back home.